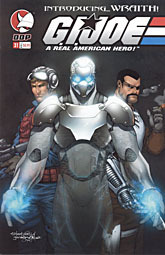 In 2004, Devil's Due (the publishers of GI Joe) partnered with Aspen Studios (the guys who drew all the backgrounds and bodies around Michael Turner's faces) to introduce a new character to the GI Joe universe: the French mercenary Charles Halifax, better known by the codename Wraith. Mercenary Wraith was known for years by the GI Joe team and the Cobra organization. Each group hoped that the skilled spy and fighter would choose to join them. In the end, Destro was the only one who discovered what Wraith truly lived for: chaos and destruction. Wraith doesn't care about causes or sides, right or wrong; he cares only about the next mission or battle, the next chance to cause harm. Using stolen technology, he acquired a stealth assault suit that makes him virtually invisible. He is protected from weapons fire by impenetrable ceramic plates and is an expert marksman with the built-in forearm cannons. The only flaw in the suit is that an outline of him can be seen if he moves too fast, but by then he is so close to this target that you only get a quick, shadowy glimpse before Mercenary Wraith makes his move. Wraith is an interesting character. Well, no, that's not right: he's a dreadfully dull character with no memorable personality at all. What's interesting is people's reactions to Wraith. Joe fans don't care about him, and think the high point of his comic career was when he died. Non-fans, however, seem to love the guy on sight, with our own Poe going so far as to say he "looks and sounds like the Joe-verse's Boba Fett" (but meaning both the good and bad parts of that). What is it about Wraith that makes him such newb-bait? Heck if I know. 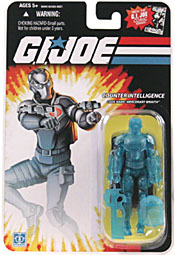 The figure's body is mostly a repurposed version of the third Generation 3 Snake-Eyes: the one wearing Generation 1's 1989 costume, with the knives on the chest and the three-piece nunchucks? It's a decent choice, since anything Snake-Eyes wears is going to have a definite espionage feeling to it. The undershirt's padded texture does a good job of mimicking the armor's honeycomb pattern, and the new shins and forearms have the appropriate bulky design. The helmet's faceplate flips up to reveal Wraith's real face. I guess that's so he can eat on the job - otherwise, why risk having your picture taken when your entire raison d'etre is to be stealthy? The mask is hinged, so it flips up easily, and can even be removed if you so choose. When it's on, Wraith has electric blue eyes; when it's off, you can enjoy his Frency facial features - even the wee pencil mustache. So the figure's looks are okay, even if the molded armor doesn't quite match the comic art, but a toy has to do more than look good, and the G3 GI Joes are notorious for their fine articulation. Unfortunately, that's where Wraith fails. Oh, he has all the same joints as any other TFAC Joe, but many of them are severely restricted. We'll start with the good: his head is a true balljoint, as are the hips, and he has double-hinged knees and swivel/hinge ankles. The wrists are swivels, but that's all they need. Now the bad. The shoulder flaps are a molded piece of the removable armor, meaning they constantly block the toy's shoulders from moving adequately. Same goes for the torso, which hides beneath the armor. His elbows are balljoints, but don't expect to actually use them. The figure has guns mounted on his forearms, but they're connected by three thin tubes to his biceps: bend them too often and they'll snap; rotate them too far and they'll snap; press on them wrong and they'll snap. Basically, the things are just a weak point waiting to give, a bad design decision that should have been cut off at the earliest stages. And in fact, that's what you may want to do: cut them off before they break. 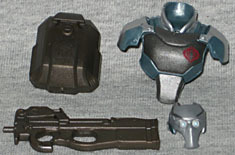 Other than the facemask and inexplicably designed body armor, Wraith's accessories include an oversized Belgian FN P90 machine gun which he can in no way hold, and an exceedingly plain backpack, which matches the rest of his armor only in that it looks nothing at all like the actual character's designs. 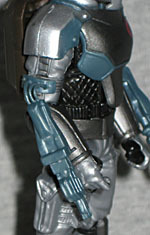 Wraith is painted in grays, black and silver, with a bit of metallic blue and a Cobra symbol on his chest. His fleshtone is good, and the paint there is crisp. There's also a chase variant of Wraith, meant to duplicate his stealth capabilities. The variant is molded in translucent blue plastic, but his face is still painted: after all, it's not like the suit actually turns invisible, it just uses innumerable small cameras to shoot an image of what's on one side of him and show it on the other. So when the mask is up, the illusion is broken. If a French super-spy in stylish ceramic armor sounds familiar, that's because it is: Grant Morrison did the same thing two years earlier in New X-Men with Fantomex. We'll be charitable, and assume that both Morrison and Wraith's creator Brandon Jerwa were drawing upon the same influences: namely, the Italian comic character Diabolik, who most readers will recognize from the video for the Beastie Boys' "Body Movin'." In fact, Wraith's first appearance was in a three-part backup story titled "Fantom," and Diabolik was influenced by the earlier French character Fantomas. This review has been very harsh on Wraith, but don't think he's best left ignored. With just a few minor tweaks, he can be another nice addition to your Cobra forces, and it's cool to see a solid reminder that characters created for the Devil's Due books are every bit as "real" as Larry Hama's work in the '80s.